Finally, finally! The day I was dreaming of a year and a half ago when I started teaching myself how to use Photoshop to create repeating patterns out of my artwork. 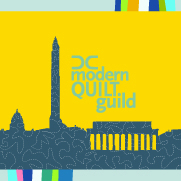 Definitely the day I was hoping for 11 months ago as I hopped on a plane to Houston to take my portfolio to Quilt Market and try to make a connection with a company who would want to print my designs. When Garrett got home from work yesterday he called to me from the front door. I thought maybe the kids had left something questionable out on the porch (always a possibility) but there he was, staggering in with a ridiculously heavy box with a Seattle return address… Of course we took it straight to the room with the best natural light and started pulling it out. 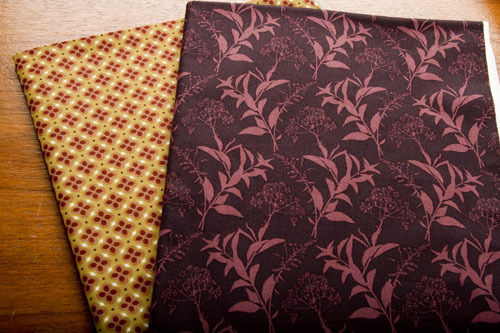 90 or so yards of my own designs, printed on actual fabric and available for sale. Awesome. 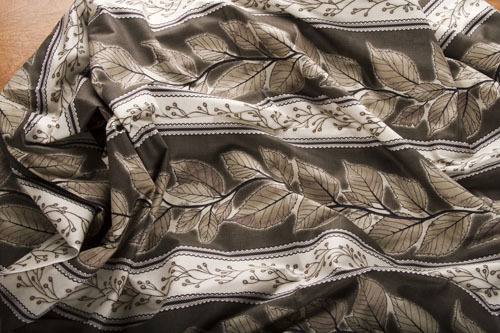 The designs are printed on the wonderfully fine, silky smooth cotton that In The Beginning Fabrics is known for. Really, it’s hard to stop touching it. True story- last year at the Fall Quilt Market after Jason offered me a contract to design for In The Beginning, he gave me some samples of Keri Beyer’s Dream a Little Dream line to take home and play with. On my way back home, I spent the entire flight with the samples on my lap just stroking them, loving the texture. I was imagining tiny projects I could make with the samples, picturing my own designs printed on a cute little bundle of fabric like Keri’s, and furiously scribbling in my notebook under the heading “to do next.” (Then after I got home I proceeded to trot the samples out each time someone came to the house and said my designs are going to be printed on fabric just like this! Really.) Oh I have been excited for this! I designed the stripe so that if you are using it as a border for your quilt, you can get all four sides out of one length of fabric. See? Four sides, four stripes. No waste. This pattern wins the award for most mutations during the design phase. The first draft of the print used 16 colors and the plants were each about 12 inches high. I kept simplifying and simplifying until I ended up with this, two colors and 4 inches high. I tried out dozens of two-color combinations before I fell in love with this one. I have worked up a few patterns to go with this collection and I have plans to sew up a mini trunk show for my (formerly) local quilt shop, Patches, in Mt. Airy Maryland. (We moved, not them). These ladies have been so supportive and lovely to me ever since I bumped into them at Houston Quilt Market last year when I was pitching my designs and looking for a fabric company to partner with. So. I think I will make a throw-sized quilt for them out of these ones. I love how the bits of rust/orange give life to the more subdued greens and purples. I also have a pattern that uses a scrappier mix of fabrics and features embroidery that can be made into either a wall quilt or a set of pillows. I would like to see that one in both the purple/green/rust colorway and the taupe. I do love me some taupe. There are so many more samples I wanted to make up out of this, but I got the call this morning from Patches that they got their fabric yesterday too, so I had to whittle it down to what I liked the best and thought I could get done in a reasonable amount of time. Two small-ish quilts it is. Now the time I’ve really been waiting for- time to get sewing! LOVE your blog page! You are so creative and such a neat woman! I am very thfknaul you were brought into my life. Very thfknaul indeed. I saw this at Patches the day it came in and I have to say I am so happy for you. The ladies at Patches could not stop talking about you and how proud they are of your success. Beautiful ! And aren’t those Patches ladies wonderful?! It was my favorite diversion when we still lived in Maryland. Jessica your web site is wonderful and I like the photo\’s of the quitls that Sandy did.I have notice that on the right hand side their are all these files for the designs in different formats it looks confusing it should say designs formatted for your machine. maybe its just me being confused thanks for the free pattern. 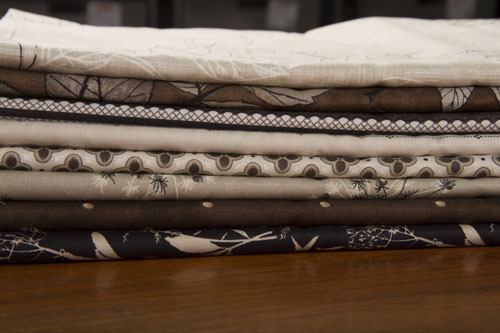 Today in my local quilt shop I saw the quilt made up in the neutral tones in the pattern on the In The Beginning website. It is stunning! Love this line – nice job! 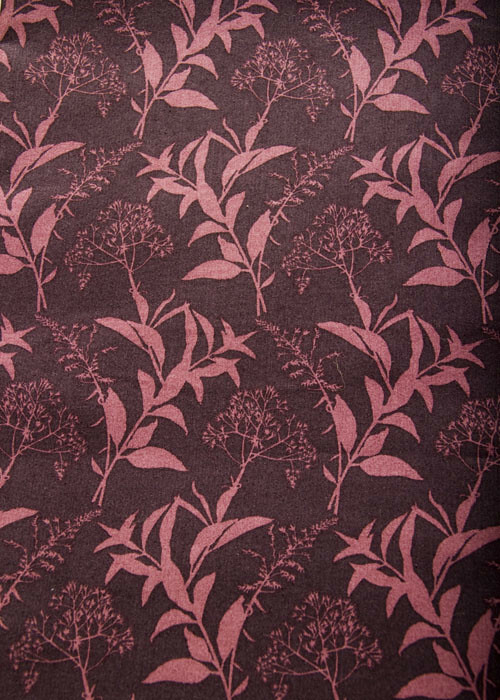 Thanks for letting me know you saw my fabric- that makes me so happy! If you don’t mind my asking, what’s the name/location of your local shop? Yay, I’m glad you like the fabric. 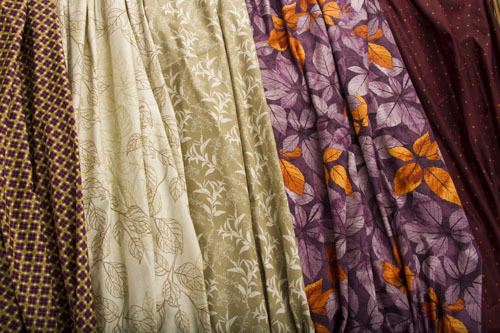 I can’t wait until I’m setlted in Belgium and can get working on my projects with the same fabrics. I keep passing by it in the storage boxes, but I don’t have sewing time right now. I hope you can find a good project or two for it. 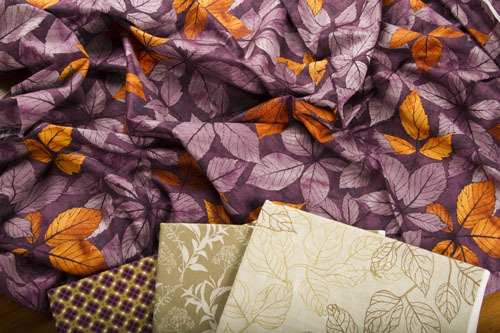 I am desperately searching for the Autumn Gatherings fabrics. 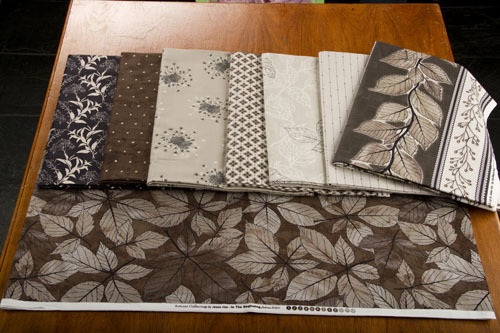 The browns, taupe and blacks are just what I have been searching for. I live in Michigan but would gladly pay shipping from anywhere in the us. 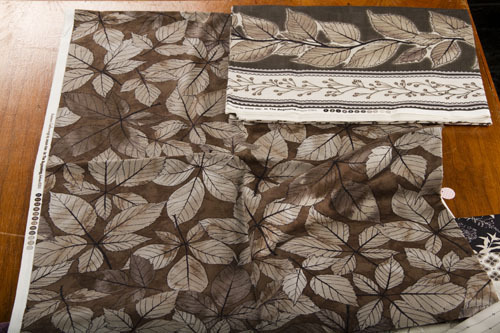 I need 4 yards of the boarder, the over all leaves and the 3 yards of the brown with the tan dot. please email me. 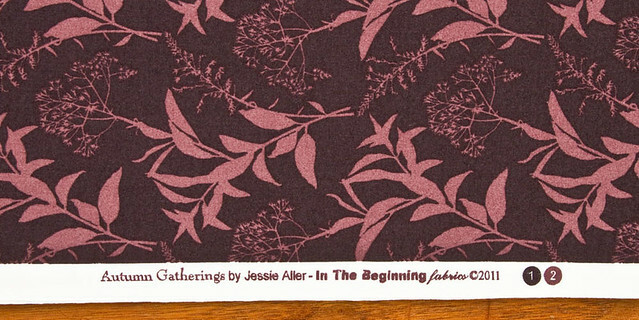 Hi Jessie, A friend of mine is making a very special quilt for someone. 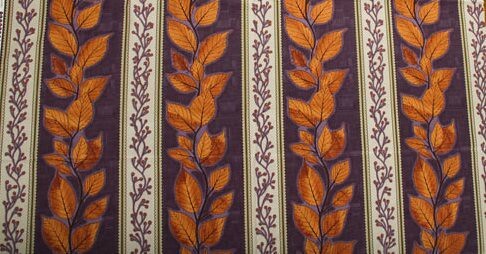 Earlier this year she bought some of the gold, red, beige and orange all over small leaves fabric. That shop has gone out of business and she is short about 1/2-3/4 of a yard. Do you know where we could get some? Please help us.